This is tip #100, the end of the guaranteed daily Pro PR Tips. Thanks all for reading and for the support. 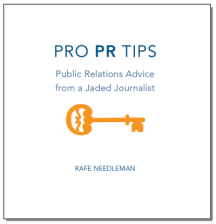 From this point on, I will post Pro PR Tips as events that warrant them happen to me or as people send me ideas (rafe.needleman@gmail.com), but I just won’t be posting every single day. And in case you were wondering: All 100 tips, except those attributed to others, are based on my own personal experience. I didn’t make anything up. I’m not that creative.